Welcome back to “Movies You Have Not Have Seen….But You Should”. This week’s installment features the 2000 drama Thirteen Days. The film stars include Kevin Costner, Bruce Greenwood, Steven Culp and Dylan Baker. The film is based on a real event. It is set against the backdrop of the Cold War. The year was 1962 and the month was October. The United States and the Soviet Union were at odds and tensions were high. Surveillance photos taken by U-2 spy planes showed that the Soviet Union sending nuclear weapons to Cuba. This could be seen as an act of war. What followed was nearly two weeks of those two countries staring each other down to see which one would blink first. This would become known as the Cuban Missile Crisis and would be one of the defining moments in the presidency of John F. Kennedy. 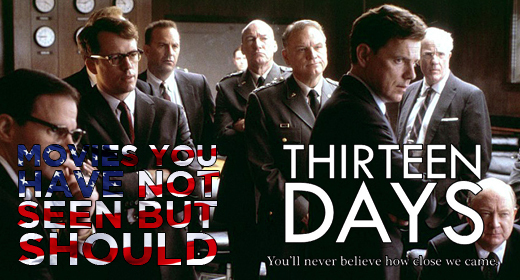 Thirteen Days was in part inspired by the book The Kennedy Tapes: Inside The White House During The Cuban Missile Crisis by Ernest May & Philip Zelikow. The film shows the time frame of the crisis, the major events that took place but also the personal relationships of some of the participants. A lot of the film is seen through the eyes of Kenneth O’Donnell (played by Costner). O’Donnell was the Special Assistant to President Kennedy. He was a friend of the Kennedys and was even roommates with Robert Kennedy while in college at Harvard. O’Donnell’s character in the film is a sounding board to the Kennedy brothers throughout the crisis. Costner did a good job in portraying O’Donnell (whom the filmmakers took some liberties with the role that O’Donnell actually played in the crisis) and helps the viewer connect with what’s going on in the White House. John F. Kennedy is played by Bruce Greenwood (who’s also known for his role as Captain Christopher Pike in the 2009 version Star Trek & Star Trek Into Darkness). Greenwood does a tremendous job getting into the role of JFK & pulls off the look, mannerisms & voice of the president. Robert Kennedy was played by Steven Culp. Culp, (who is more known for his TV roles on The West Wing & Desperate Housewives) like Greenwood’s JFK, gets into the role of RFK and makes it believable to the audience. With two such iconic historical figures as JFK & RFK, the bar is pretty high for anyone to portray those two in film but these two do an admirable job of it. Along with Dylan Baker (known by many as Dr. Curt Conners in Spider-Man 2 & Spider-Man 3) as Secretary of Defense Robert McNamara, the filmmakers did well in selecting these actors to help bring these historical figures to the big screen. Thirteen Days may not have been a box office success but it was well received by critics (received 83% by critics and 76% by audiences on Rotten Tomatoes) and is a good historical drama (even with some liberties taken within the story of the actual events) It is available on DVD (and for a pretty low price on Amazon). It’s worth checking out to see why the critics (along with this columnist) suggest this film. It’s one you may not have seen, but you should.